Japan will investigate a report that workers at the stricken Fukushima Daiichi nuclear power plant were urged to disguise their exposure to radiation. Build-Up, a subcontractor for plant operator Tepco, admitted one of its executives told workers to put lead shields on radiation detection devices. Otherwise, they would have rapidly exceeded the legal limit for exposure. The Fukishima plant was devastated by the March 2011 earthquake and tsunami. Cooling systems to reactors were knocked out, leading to meltdowns and the release of radioactivity. Tens of thousands of residents were evacuated from an exclusion zone around the plant. 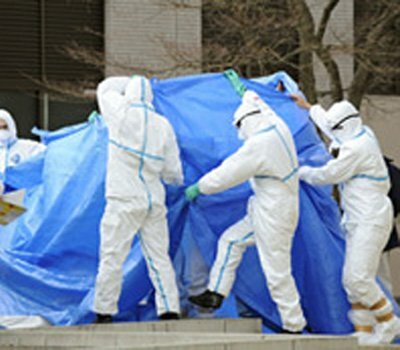 Between November and March this year, a group of Build-Up employees were working at Fukushima, trying to restore facilities. In December, a Build-Up executive told them to cover their dosimeters with lead casings when working in areas with high radiation. Otherwise, he warned, they would quickly reach the legal limit of 50 millisieverts’ exposure in a year, and they would have to stop working. Build-Up president Takashi Wada told Japanese media nine of the workers complied. Dosimeters – used to measure cumulative exposure – can be worn as badges or carried as devices about the size of a smartphone. The workers had a recording of their meeting, the Asahi Shimbun newspaper said. “Unless we hide it with lead, exposure will max out and we cannot work,” the executive was heard saying in the recording, as quoted by the paper. The executive apparently said he used one of the lead shields himself. A Tepco spokesman told Reuters on Saturday the company was aware from a separate contractor that Build-Up made the lead shields, but that they were never used at the Fukushima plant. Earlier this month, a Japanese parliamentary panel concluded the disaster at Fukushima was “profoundly manmade” and its effects could have been “mitigated by a more effective human response”. All of Japan’s nuclear plants were shut down in the wake of the disaster but one, in the town of Ohi, has now partially restarted.